I've been working my way thru the Oz series. I enjoy picking out petty inconsistencies in richly-textured fantasy worlds, and it is nice the have some material fresher than the Star Wars galaxy, or the newly-democratized and stable Iraq. Here's what I've got so far, plus a few other noteworthy items and my relative ratings. It should go without saying that there are spoilers here for those who haven't read all the books. The most consistent of all the Oz books, because there was only one at this point. Clearly, no one should rely on Dorothy’s assurances that Toto never bites. Dorothy periodically stops crying long enough to sing. Some witches good, some evil, no one sure why. Lion. Guy barely disguised as lion. Whole danged thing is a dream. Mombi isn’t very bright to leave Tip alone after announcing her intention to transmute him into a statue. One can see why Mombi has remained firmly on the supporting tier of the wicked witch pantheon. The Scarecrow identifies the winged monkeys as Glinda's slaves. However, Glinda promised to free them after the events of The Wizard of Oz. I prefer to think that the Scarecrow is merely mistaken, since the alternative would make Glinda a welching slaveholder. Is the Emerald city green or not? “But isn't everything here green?” asked Dorothy. When Glinda enters the occupied Emerald City without spectacles in Marvelous Land, every indication is given that the city actually is green. 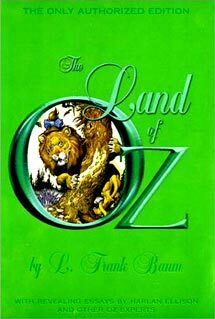 The 2003 "authorized" edition features a drawing of the Cowardly Lion on its cover. The Cowardly Lion does not appear in The Marvelous Land of Oz! Why don't they just wish to be at Glinda's castle? Or to expel Jinjur's army? Jack, the Sawhorse, & the Gump needed magic power to bring them to life. Later, in The Emerald City of Oz, it is revealed that the Paper Doll people are only alive because Glinda provided special “living” paper. No explanation is ever provided for why the Scarecrow is alive. Glinda is no longer a witch but is now instead a sorceress. I presume the 19 Aughties saw one of those cyclical little Great Awakenings and incumbent, ill-conceived purge of anything spooky from children's literature. But I am too lazy to go research it. What are the odds that random natural disasters would transport Dorothy to a magical fairyland twice? In Dorothy and the Wizard in Oz, an earthquake sends not just Dorothy, but also the Wizard of Oz to a magical fairyland. Tip's fears were proven to be well founded; for with the first streaks of gray dawn they looked over the sides of the sofas and discovered rolling plains dotted with queer villages, where the houses, instead of being dome-shaped -- as they all are in the Land of Oz -- had slanting roofs that rose to a peak in the center. Odd looking animals were also moving about upon the open plains, and the country was unfamiliar to both the Tin Woodman and the Scarecrow, who had formerly visited Glinda the Good's domain and knew it well. Tiktok may be the first robot to appear in literature. A friend suggested that the guy who wrote The Nutcracker may have used one earlier, but so far I have been too lazy to go to the library for an English translation. "Excuse me," replied the Scarecrow. "My eyes are not painted to shut. Because you happen to have tin eyelids, you must not imagine we are all built in the same way." "And the eyes of the Saw-Horse are knot eyes," said Jack, leaning forward to examine them. Despite this, the Sawhorse blinks upon meeting Dorothy. What powers the cast iron giant? Although built by the same company, he doesn't seem to require winding-up, like Tik-Tok does. 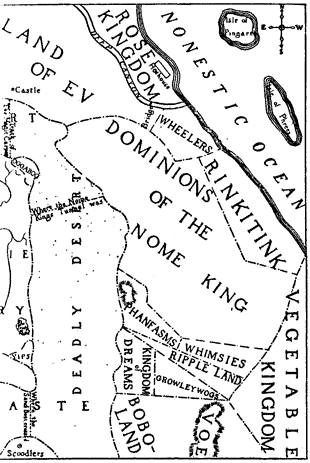 For Ozma of Oz ruled the King of the Munchkins, the King of the Winkies, the King of the Quadlings and the King of the Gillikins just as those kings ruled their own people. The King of the Quadlings? Has Glinda been puckishly toggling her gender? Then came the Rulers of the four Kingdoms of Oz: the Emperor of the Winkies, the Monarch of the Munchkins, the King of the Quadlings and the Sovereign of the Gillikins. Perhaps Glinda serves as the power behind the throne for the Quadling king, as she arguably does for Ozma herself. 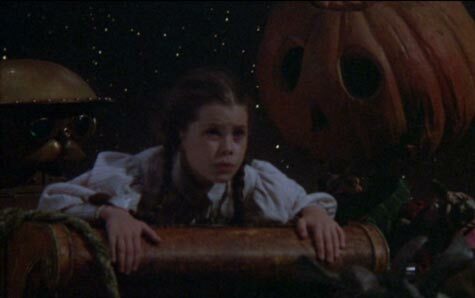 I can't resist the temptation to comment on the dark but surprisingly okay 1983 Disney movie Return to Oz. This movie is basically Ozma of Oz with a few characters from Land of Oz thrown in and with most of the action relocated from Ev to Oz. The Nome King, compellingly realized through claymation, has recovered Dorothy's ruby slippers from the 1939 movie and used them to conquer Oz. This adds a nice note of urgency. Princess Langwidere and Mombi are composited into a single, creepy villain to some effect. Tiktok, Billina, the Gump, and Jack Pumpkinhead are brought to life with Henson magic and look terrific. Another nice touch is that the Nome King has apparently completed the tunnel described in The Emerald City of Oz. The Deadly Desert is described and located correctly. The distance between the Munchkin country and the Emerald City seems to have been reduced. And that was the last any of them ever saw of Oz, the Wonderful Wizard, though he may have reached Omaha safely, and be there now, for all we know. Despite this assurance, the Wizard is reunited with just about everyone in the Emerald City. The road that Dorothy and company travel in this book is not really a road to Oz, as it ends in a purportedly impassable desert that nobody knows how to cross. at the North of the Emerald City lives a clever sorceress called Glinda the Good, who commands the spirits of the air. Is the Nome king right that Glinda has relocated from the South? Maybe she just summers there. If so, she is apparently unconcerned by the threat of a Nome invasion, as she waits until afterwards to do anything about it. she noticed coming toward her a group of the queerest people she had ever seen. They were not as big as the grown folk she had always been used to; but neither were they very small. In fact, they seemed about as tall as Dorothy, who was a well-grown child for her age, although they were, so far as looks go, many years older. Ruggedo drank the water of forgetfulness in the Emerald City of Oz. So how can he remember having an egg thrown at him in Ozma of Oz? Hank the Mule lands on the shores of Ev, but does not gain the abillity to speak until later being transported to Oz. Why, then, was Billina the Hen able to speak immediately upon reaching Ev in Ozma? I've found my own country, at last, and it is not far from here, either. it's a long journey to Orkland and I and my cousins here are all rather tired by our day's work. Another thing: ever since Emerald City, isn't Oz supposed to be invisible to all outsiders? "No, my dear," Glinda answered, assuringly. "We shall still be able to see each other and everything in the Land of Oz. It won't affect us at all; but those who fly through the air over our country will look down and see nothing at all. Those who come to the edge of the desert, or try to cross it, will catch no glimpse of Oz, or know in what direction it lies. Yet somehow Trot, Bill and the Ork fly right in. This is pretty hard to reconcile. At the end of the book, why didn't Dorothy use the magic belt to transport her new friends from the South to the Emerald City? Ignoring the whole east/west inversion issue, the placement of kingdoms surrounding Oz on the extended fairyland map doesn’t make sense. For example, the Vegetable Kingdom is deep underground. Why would it appear on a map at all? The Wizard brought to me the girl Ozma, who was then no more than a baby, and begged me to conceal the child. Not a girl-fairy. Not a witch-girl. Like Ms. Stefani said, just a girl. Road to Oz introduces Polychrome and the Ryls as fairies. Ozma, however is still girl ruler of Oz. Emerald City of Oz reveals that Ozma has certain fairy powers and a fairy wand. 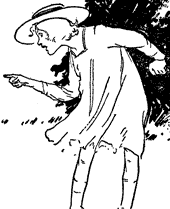 Then in Scarecrow of Oz, we are informed that Ozma was "Born of a long line of Fairy Queens". By Lost Princess of Oz, Ozma "is herself a powerful fairy". Maybe there were other ducks, until Dr. Professor Bug made a suit of them. It would be easy to overlook this inconsistency, if there weren't another mention of ducks earlier in The Magic of Oz! In Chapter 9, the Kalidah boasted "We can swim like ducks". "Treason! There's a traitor here with magic powers!" Also, what's the deal with the Cowardly Lion and Hungry Tiger eating bees? I'm not sure what to do with that. Mercifully, the protagonist count of the first half of the book is limited to two (Dorothy and Ozma), as opposed to the usual forty-seven. Why, after sitting it out so many times, does Glinda finally take the field herself in this last book? Perhaps she is bored. Other than that, Glinda of Oz is fairly consistent. It is amusing that Rora Flathead has not merely been converted into a pig, but into a golden pig. And the new, bizarre compartmentalization of magic into fairy, wizard, and sorceress varieties is kind of interesting. A good many others would like to be Supreme Dictator, but as I made a law that I am always to count the votes myself, I am always elected.